Gently scoop ice cream onto the pizzelle. This works best if ice cream is left to soften, as cookies are very delicate. 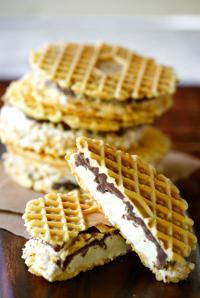 On another pizzelle, spread chocolate hazelnut; the spread can be warmed for easier application. We used a thick layer of chocolate hazelnut spread, a 3/4-inch layer of ice cream and dipped the edges in chopped hazelnuts. For best results, individually wrap sandwiches and freeze.